Hi, I would love to grow some of the acorns from the tree. I run the Campsite stewards team for Park Home Ground and my kids have always loved going into the Childrens Field. A friend of ours died this summer and it would be so fitting if life could come from this, many trees are being planted in her memory. Ellie had been to the festival all her life, only missing the first available to her when she was only 3 weeks old. She worked there this year banding the people working in the Healing fields. It was a place she loved and was truly happy. 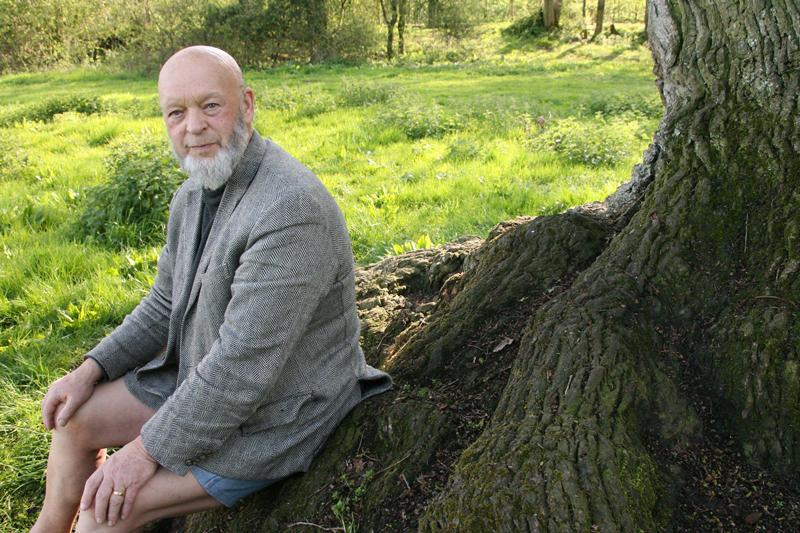 “I have been coming to Glastonbury since I was 3 months old in 1984, and every year since 1995. I remember coming to the kids area of the Greenpeace field every year to sit under the tree. It wouldn’t be Glastonbury without a nap under the Oak tree on a sunny afternoon.” Ryan. 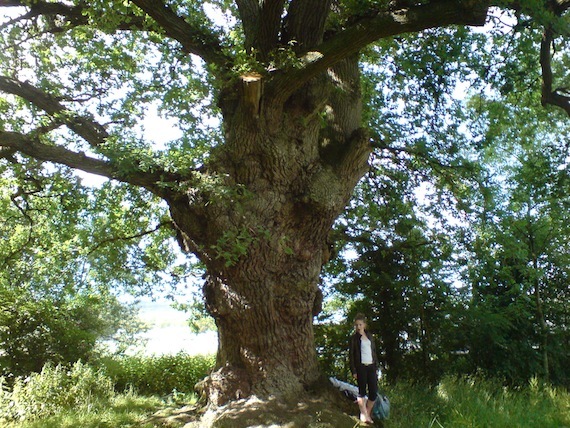 “The Oak tree at Glastonbury Festival holds wonderful memories for me as my husband proposed to me up the tree in 2009, 12pm the night of summer solstice. It was very romantic and he even got down on one knee! We were there early as we work in Cal’s Garden in the green fields every year. Each year we go back and spend time at the oak tree. It also holds childhood memories for my husband as he spent every year there growing up.” Izzy. Izzy and, below, Izzy’s husband. This Oak tree has played a major part of our lives and growing up, which takes in the last seventy years (and even more). To the best Oak tree in Somerset – Thanks! In 1990 I played didjeridu for Druidic ceremony, sitting up in the tree with a circle of berobed Druids below. I prayed for English Oaken strength. That evening I met Liam from the Hothouse Flowers. I was swept onto the mainstage with them and a career in music was launched. This year I played here again as a member of that same band. Circles. Strength. Dear dear Mother Tree. I visit her every year. I thank her. I love her. I have come to Glasto since I was a baby and I always remember it. Sat in this tree two years in a row and was something I always looked forward to! really fun watching the world go past! One of the strongest memories I have is laying under this tree with my son, then aged 3, looking up at the sunlight coming through the leaves. Timeless. Wonderful memory. Sophie thought how her Grandad could have sat under this tree. This is a short piece about Nicky “Big-Top” Flood – born from a miracle 1947, died from a heart attack April 2008. He is remembered each year. Most of us knew Nicky for the red and yellow big top marquee with the ridiculous banana leaf sticking out of the top of the central pole. Nicky made that tent – and several other festival creations as well. He’d arrive early, set up, and then hide in his black Winnebago that looked like a giant tank around the back. Occasionally in the middle of the night you could hear him on his trumpet – as well as an extraordinary tent maker, he was also a fine jazz musician, playing professionally and a key member of the Mystery School Ensemble. Nicky was kind and avuncular with a great sense of humour. He could also be a grumpy old sod, especially when his knees got bad, but it never lasted long, and was only skin deep. He worked hard, played hard and always made time for chats and cups of tea (or the odd glass of whiskey) with friends. He was proud of his bus, his tents, his music, and most of all his family. He had hundreds of friends, and we love him. Each year when we put up the marquees we still know that he is looking down on us, shouting if we make a bad job of it, and shining if we get it right. I sit under the tree each year and ask him for guidance.